Much of the literature on aid-in-dying (AID) has drawn heavily on rights-based ethical and legal frameworks that emphasize patients’ rights of self-determination in end-of-life decision-making. Less attention has focused on how terminally ill people actually experience such putative rights once they are legally authorized. This analytic essay draws on findings from the Vermont Study on Aid-in-Dying, an ethnographic study of the implementation of AID in Vermont (2015–2017). First, I show that terminally ill people can face a range of barriers to accessing AID in permissive jurisdictions, and that access to AID is mediated by various inequalities endemic to US health care, as well as some that are unique to AID. I then build on these findings to examine the utility of the concept of justice for public health scholarship on AID. By integrating empirical, ethical, and policy analysis, I reframe rights-based frameworks that emphasize the role of individual choice and decision-making at the end of life. 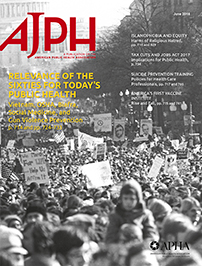 In doing so, I draw attention to health care justice as a neglected issue in public health perspectives on AID.